There’s no doubt, the healthcare software industry is tough. The purchasing cycle is painfully slow, the marketplace is crowded, your competitors have big names and deep pockets. But there is some good news too. Global healthcare spending is on the rise - in fact, Deloitte predicts that it will hit USD $8.7 trillion by 2020. The healthcare industry - always slow to change - is starting to invest in new technologies, and software is playing a leading role in transforming the healthcare sector worldwide. So how can you make sure your healthcare software is the one that your buyers turn to? It all comes down to creating a solid marketing strategy. Here’s how to make that happen. 3. Should You Use Marketing Automation? User experience is rapidly becoming a key competitive advantage that all software marketers need to consider. In other words, every interaction that customers have with your company should be optimized to be user-friendly, engaging, and cohesive. In terms of healthcare marketing, this might translate to optimizing your website for mobile, polishing up your patient portals, or providing a higher-quality level of customer support. Artificial intelligence is now a key part of a modern marketing strategy: from chatbots that handle routine customer queries to analytics tools that show your leads the optimal content and product offers. Voice search continues to be on the rise, which has changed how marketers optimize for search engines: as more users search using Siri or Alexa, search terms become more conversational, and content must therefore consider user intent instead of only basic keyword research. You may already be using text analytics in your healthcare SaaS; consider also applying it to your marketing strategy. Some examples might be analyzing previous email strategies to create a predictive model to optimize your email marketing results; or parsing vast numbers of websites of potential clients to find suitable matches for your software. Virtual reality has also become increasingly applicable to B2B marketing recently: applications include creating more powerful product demonstrations, which include visual cues to highlight key features or simulations of real-world product use, or creating “webinars on steroids” which enable you to literally walk your customer through your presentation. Content continues to play a critical role in the healthcare IT buyer’s customer journey, according to joint research by HIMSS and the Content Marketing Institute. The study found that valuable content drives action by healthcare software buyers: 97% of respondents had taken action (such as conducting product research, sharing the information with colleagues, or beginning a purchase discussion with colleagues) within the previous 3 months, after viewing high-quality healthcare technology-related information. The critical term there is “high-quality” – 90% of healthcare IT buyers stated that it was hard to find the information they were looking for. They favored content that included industry knowledge, demonstrated authority, and illustrated the information provided with case studies, and they were turned off by jargon, sales pitches and buzzwords. No discussion of modern-day marketing would be complete without looking at the huge impact of data. This is particularly the case with the healthcare industry, where data security is at a premium - but data analytics can also produce exceptional results for healthcare software marketing. Analysis of the behavior of your web users can help tell you what content is working best, and how to keep people coming back to your site; analysis of your sales portal can help you optimize the site and avoid sales falling through at the last hurdle. 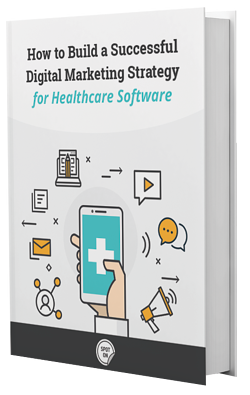 One thing is clear - healthcare software companies will need a solid digital marketing strategy to stay ahead of the charge. A successful digital marketing strategy should include both outbound and inbound techniques. HubSpot’s Marketing Mix 2018 research found that B2B marketers across multiple industries (including healthcare, manufacturing and technology) are still relying heavily on outbound techniques, including tradeshows and industry events, PPC advertising, print advertising in industry journals, and telemarketing. These methods can be highly effective. However, they can also be expensive: for instance, 53% of B2B marketers reported that events were their top marketing spend. We would therefore recommend that your digital strategy also include an inbound approach. Inbound marketing involves creating and sharing valuable content - such as blogs, articles, white papers, research, or videos, that enable the leads you target to find you. Inbound marketing costs 62% less than traditional marketing for triple the leads. Effective content can help you reach multiple stakeholders at the same time, and keep you front of mind through the long healthcare software purchasing cycle. The first step to creating a winning digital strategy is to define your “buyer personas”. The term can sound like pure marketing jargon - but it really just means clearly defining who your customers are, what problems they are looking to solve, and how your software solves those problems. Once you have a clearly articulated expression of who you are trying to sell to, what triggers them to start searching for a solution, and why they would be interested in your product, you can also begin to research and plan what information might appeal to them, what content would be most relevant, where they would be likely to view your content, and what types of content you need to include in your content strategy. Once you have your buyer personas and their buyer’s journey is well-defined, you can dive into your content strategy. The first step is to build a marketing calendar, which should include all the channels you’re planning to use (your own blog, guest posts on other sites, social media, industry forums, etc. ), topics, titles, writers, authors, and due dates. We’ve looked at the Who, and the When - now it’s time to think about the What: what content will your target market find most valuable? What information will they engage with, read, and share? Long-form content is one of the most effective ways to generate inbound leads. Long-form content could be a 1,000+ word blog post, an ebook, a white paper, or a full-length case study. This kind of content builds your reputation as an authority in healthcare SaaS, gives your brand a boost, and helps drive future customers to your door. Harness the power of social media to get your long-form content in front of your target market. 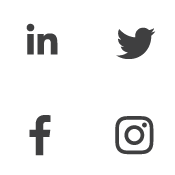 To reach healthcare software buyers, you’ll need to build a strong brand presence on at least a handful of appropriate social media channels: LinkedIn, Twitter, Facebook, and Instagram are the most popular for B2B marketing. Create polished, effective copy that delivers your messages. Avoid jargon, and prioritize simple, relevant language. Simplify complex healthcare software solutions with explainer videos. Choose an attractive design and layout to increase the impact of your main messages. Add infographics and other videos to engage web visitors and turn them into interested leads. Trust is critical in the healthcare industry, and your website is a great place to establish authority and bona fides. Use your website to showcase certificates, awards, case studies, reviews, and testimonials. To improve your search rankings, choose a few topics that are most relevant to your brand - for example, “healthcare IT.” Then create several blog posts that relate to that key topic and that would appeal to your target market. In this case, they could be “Managing a healthcare IT department,” “How to choose healthcare IT solutions,” and so on. Finally, create a “pillar page” - a top-level page on your website that unites all your blog posts into one long, high-value resource. A responsive website is a website that transforms, depending on how the user is viewing it –on a desktop, a tablet, or a smartphone. Responsiveness has become increasingly important now that more than 79% of internet usage is mobile. Make sure your website is well-optimized for mobile, loads quickly, and has well-organized, easy to find content, or risk losing significant traffic: 80% of customers will stop interacting with a website that doesn’t load well on their device of choice. TechClient reports that a blog that you update regularly makes you 434% more likely to rank highly in searches. You should be aiming to post frequently: OrbitMedia found that quantity correlated strongly with results. The majority of successful bloggers are posting “several times a month.” Make sure you don’t sacrifice quality in pursuit of frequency – shareable, useful content is far more valuable to your business. Use your content marketing calendar to keep you on track – having content planned in advance will make sure you post regularly. If you’re struggling with sticking to your schedule, consider hiring a freelance writer – an experienced content marketer can create high-quality, targeted blog posts for you. Should You Use Marketing Automation? Marketing automation can be a highly effective way to boost your results and cut down on repetitive tasks. When you’re building a healthcare marketing strategy, using automation tools wisely could save you significant time and money. On the other hand, overusing automation can backfire - for instance, shooting off too many automated email campaigns can make your leads feel overwhelmed or get your company blacklisted as a spammer. Set up workflows to automatically begin when a contact takes a specific action - for instance, downloading a specific e-book or case study could trigger a series of related email content. Set up an automatic trigger to notify sales when someone downloads some content that suggests an intent to purchase. Use a lead-scoring system that assigns points to a lead based on their behavior (such as downloading a certain number of pieces of content or viewing a certain number of blog posts) – then automatically notify sales once a lead receives a high enough score. 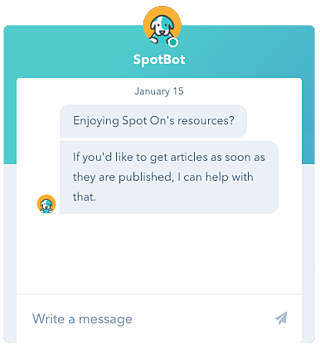 Send an automatic request for feedback into your software to make sure you get as much customer information as possible. Improve your time management with automated marketing processes, such as making sure all your leads are added to your database, or creating repeatable marketing workflows. Set up automatic report generation to stay on top of your marketing performance. Detailed reporting can be extremely helpful for both your sales team and your client onboarding team. 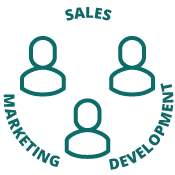 One of the critical factors in a successful healthcare software marketing strategy is creating a strong relationship between your sales, marketing, and software development teams. If your company culture is aligned around common goals, you’ll have a win-win situation – your sales and marketing teams will have a clear understanding of what makes your software unique, and your development team will know which features are most important to your target market. If you’re developing software for the healthcare industry, a close integration between product development and product marketing can make or break outcomes. Set common goals for all teams - then drill down to create more function-specific tasks. Involve all teams in joint research projects to make sure your product meets your customers' needs. Incorporate issues raised by prospective clients when they talk to your sales team into your development decisions. Bring both marketing and product development personnel into your QA process. Consider creating product teams, rather than function teams, that meet regularly to keep everyone on the same page. Finally, you’ve developed a powerful digital marketing strategy, organized your content calendar, chosen your channels, and started sharing useful, high-quality content. You’ve united your product marketing and development teams around common goals, made your marketing processes as efficient as possible, and started drilling down into your customer data. But you’re still not connecting with your market. At this point, you may need to consider personalizing your marketing strategy. Traditionally, this meant thinking about your buyer personas, and creating different marketing content for each persona - sending a different set of emails to different types of lead, for instance, or offering different content to potential customers depending on their stage in the buyer journey. However, people are more hyper-connected than ever before, and thus have increasingly higher expectations for personalized user experiences. Of course we expect companies to use our names when they email us –– but we also expect them to consider our behavior before they send us information. 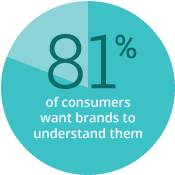 For instance, Accenture found that 81% of consumers want brands to understand them and know when, and more importantly, when not to approach them. But personalization doesn’t have to be high-tech. When it comes to marketing healthcare software, it can be as simple as remembering that your buyer personas are people - and so are you. Provide content that appeals to human beings, which could include testimonials, stories, original research, helpful tips, and other information they can identify with. Connect with them over social media; respond quickly to questions; listen to feedback and address it promptly. Make every interaction with your company effortless, enjoyable, and positive. Putting together a healthcare marketing strategy takes time, effort, and money - so how do you make sure you get a return on your investment? Of course, there’s no such thing as guaranteed results - in marketing or in any other area of business - but there are definitely things you can do to maximize your chances of success. A quick-win mentality can do more harm than good in the healthcare SaaS business. Train your customers to expect special offers, seasonal discounts, or low-cost deals on your products, and they’ll simply wait for the next price drop to buy. Digital marketing is the best way to get a solid return on your initial marketing investment. A digital strategy is typically cheaper, more effective, and more engaging than old-school hard-sell outbound methods - but you must stay consistent to see results. You’ll need to allow 6 - 12 months of consistent, high-quality inbound marketing effort to see your traffic grow and your leads pipeline start to fill up. But the leads that start to flow in are already pre-qualified, engaged with your company, and connected with your brand. Marketing healthcare software in today’s digital environment is certainly challenging. However, with a solid marketing strategy, high-quality, personalized content, a well-aligned team, an efficient use of automation, and a long-term approach based on building relationships and delivering value to your target market, there should be nothing to hold you back from success. If you’d like our help taking your digital marketing strategy to the next level, don’t hesitate to get in touch.